Sometimes writing reviews is a really good thing. A while ago I got an e-mail from one Rob Town, who thanked me for my review on Winger’s latest album Better Days Comin’ (an album every rock fan should own) and posted a link to an album with another one of his bands – apparently he works with Winger – and would I check them out and write a review on their new album? Being a guy that likes to check out new bands, I gladly accepted and got the album. 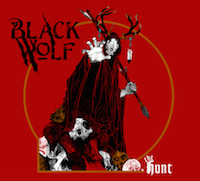 The band in question is BlackWolf, a five piece from Bristol, England, that has just released their debut album The Hunt (they released an EP, Taking Root in 2012). The band, formed in 2010 and likes their rock raunchy and rocking with a great deal of attitude. They have opened up to bands such as Voodoo Six, Electric Eel Shock and Voodoo Johnson, if you know them, but their biggest achievement to date must be that they attended the biggest biker festival in the world, the Bulldog Bash, in 2011 that drew some 40 000 people. They have been compared to “new” retro acts like Wolfmother, Rival Sons, The Answer and The Black Spiders, but their (other) influences goes from bands such as Led Zeppelin, Aerosmith, Guns N Roses but also stuff like Pearl Jam, Avenged Sevenfold and Metallica. Sounds like pretty cool, mix, huh? Knowing all of this, why wouldn’t one want to give this a listen? Said and done, it was time to get down to business, but before the review starts, here’s an introduction to the members of the band: Scott Sharp – vocals, Jason Cronin and John Greenhill – guitars, Ben Webb – bass and Thomas Lennox-Brown – drums. I push play and “Mr Maker” runs through the wire of my headphones and the song is a total knock-out. It’s a heavy, Zeppelin-riff-happy groover. Cool. This album could have started worse, for sure. “Keep Moving On” is brilliant and sounds like a heavier version of 70’s Kiss. I’d say that Rock And Roll Over (1976) is the closest comparison. “Faith In Me” is an acoustic based ballad that reminds me of Blind Melon, a band I was never a fan of, but I find this song really great. I fell madly in love with the guitar sound and melodies of “Moving Mountains”, a really catchy piece of rock and “House Of Emerald Wine” rocks with an awesome groove and it sure sounds like the perfect mix of Rival Sons and Scorpion Child. That can never be a bad thing, folks. Scorpion Child comes to mind again in the heavy and slow ballad “Raised On The Sun”, an emotionally moving tune. On “Relief” they’ re almost too close to Led Zep for comfort, especially when singer Sharp here sounds so much like Robert Plant it’s scary. Still, the song is really great, so I’ll let that one slip. BlackWolf leaves us wanting more with the closing “Sea Of Mercy” where they sounds like The Sweet meets Led Zeppelin for a song on their Desolation Boulevard (1974) album and again, how can that ever go wrong? Right – it can’t! With that, I thank you very much for the link, mr Town. It’s always invigorating to hear a new band that goes all retro on you but is never far away from developing their own modern sound and style. But to be honest, I have a real hard time getting the Avenged Sevenfold and Metallica influences anywhere on this record. I’m not gonna have any problems to foist this on anyone I know who’s into the sound and groove of the greatest decade in rock, the seventies. I have written this before, but I really need to pester this, when the all the giants of rock – AC/DC, Kiss, Iron Maiden, Aerosmith and festival headliners such as Whitesnake, Scorpions, Judas Priest and ZZ Top calls it quits, we need some bands to inherit the crown. In my world, Rival Sons, Scorpion Child, The Answer, Black Stone Cherry and Airbourne are the logical heirs. I’d like to add BlackWolf to that list. This album is only the odd filler away from getting the full monty from me – and I have a feeling everything will get even better. The world needs bands like this so if classic rock is your deal, support them!